Loaded For Bear? There's An App For That! If you're familiar with that Hotels.com claymation TV commercial where the father is attacked by a bear, it appears that being privy to a bear's location might take priority over finding a hotel room for the night. Well, if you're traveling to Yellowstone National Park any time soon, you can come loaded for bear - because now, there's an app for that too! 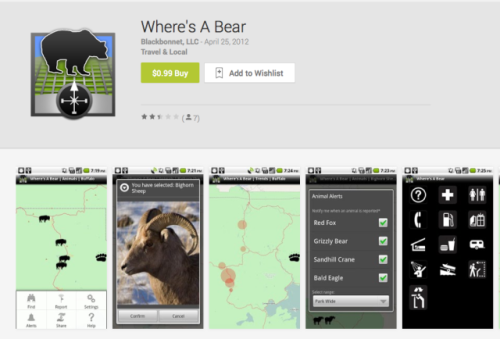 Available for 99 cents, Google's Android smartphone and their developers Blackbonnet have just launched an app called "Where's a Bear." It's a great service for tourists who want to track wildlife sightings alerts for not only those big old scary grizzly bears, but also for any species of your choice. It's intent is to allow users to maximize their Yellowstone vacation time by taking the guesswork out of finding the best places to see the park's primary residents. An additional feature called the "Old Faithful Countdown" displays how much time remains before the famous geyser's next eruption. A second app, the Yellowstone Wildlife app which doesn't include the "finding the bear" feature is now also available in addition to Androids, on iPhones and iPads, where you can obtain real time updates of Yellowstone wildlife sightings for free. Even when one's smartphone is without service (as cellphone reception in the park is intermittent), the application will store all your sighting information and upload it automatically when service is regained. Like the 'Where's a Bear' app, you can set up notifications by choosing from a list of 19 available species. Somewhat hesitant that the popularity of the app could cause heightened traffic in the park, some park officials are concerned that large crowds of tours could overwhelm park rangers who are trying to keep visitors a safe distance away from unpredictable animals like grizzly bears. "If it did take off, it would be a concern," Yellowstone spokesman Dan Hottle told the Associated Press. "It's got other applications, but at its worst core, it would send more people to wildlife jams." So are you loaded for bear? Or do you fear you might become game for bears loaded for tourists? If so, perhaps the calming lapping sounds of "Old Faithful" is the site you'd like to track? That is, unless the government hasn't turned off the faucet, due to lack of funding. Keep Your Dogs Warm This Winter With Heated Pandas, Pigs, Puss Cats, and More! Twin Pandas Fathered by Two Fathers?